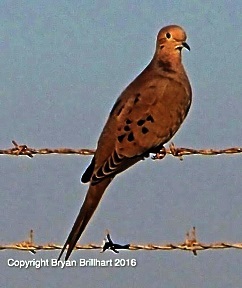 Bryan Brillhart Photography Presents Dig Imperial Beach "Bird of the Week", the "Mourning Dove"
Bryan Brillhart of Bryan Brillhart Photography presents us with the Dig Imperial Beach “Bird of the Week”. 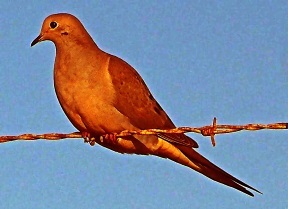 This week’s bird is the "Mourning Dove (Zenaida macroura)"
dove family, Columbidae. The bird is also known as the turtle dove, American mourning dove or the rain dove, and was once known as the Carolina pigeon or Carolina Turtledove. It is one of the most abundant and widespread of all North American birds. It is also a leading gamebird, with more than 20 million birds (up to 70 million in some years) shot annually in the U.S., both for sport and for meat. Its ability to sustain its population under such pressure is due to its prolific breeding. In warm areas, one pair may raise up to six broods of two young each in a single year. 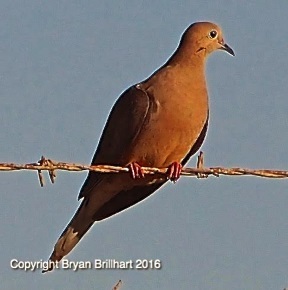 The mournful cooing of the mourning dove is one of our most familiar bird sounds. From southern Canada to central Mexico, this is one of our most common birds, often abundant in open country and along roadsides. European settlement of the continent, with its opening of the forest, probably helped this species to increase. It also helps itself, by breeding prolifically. They do very well in man-altered habitats, and numbers probably have increased greatly with increasing settlement of North America. 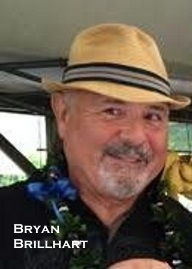 Habitat is in farms, towns, open woods, roadsides, and grasslands. They are found in almost any kind of open or semi-open habitat in temperate parts of North America, including forest clearings, farmland, suburbs, prairies, and deserts. They may be most common in edge habitats having both trees and open ground, but are also found in some treeless areas. They avoid unbroken forests. Mourning doves forage mostly on ground, but sometimes will perch on plants to take seeds. They will come to bird feeders, often eating on the ground under elevated feeders. They eat quickly to fill crops with seeds, then digest them while resting. They regularly swallow grit (small gravel) to aid in digestion of hard seed. Diet is seeds, feeding almost entirely on seeds (99% of diet). They favor seeds of cultivated grains, but also those of grasses, ragweeds, and many other plants. Occasionally they eat snails, and very rarely insects. In courtship, males fly up with noisy wingbeats and then go into a long circular glide, wings fully spread and slightly bowed down. On ground, males approach females stiffly, their chest puffed out, bowing and giving an emphatic cooing song. Members of mated pairs may preen each other's feathers. Males lead females to potential nest sites chosen by females. The site is usually in a tree or shrub, sometimes on the ground, and sometimes on building ledge or other structure. Sites are usually lower than 40', rarely up to 100' or more above the ground. Nests are a very flimsy platform of twigs; males bring material, females build the nest. parents feed their young "pigeon milk." Young leave their nest at about 15 days, and usually wait nearby to be fed for the next 1-2 weeks. One pair may raise as many as 5-6 broods per year in southern areas. This bird can be commonly spotted perching on the electric wires along the perimeter trail in our own Tijuana Estuary. Listen for their soothing coo! Until Next week, happy birding!